For every e-reader on the market today, there is a smartphone app to serve as its companion. Kobo is no exception. In direct competition with the Amazon Kindle and Barnes and Noble's Nook, Kobo needed to give themselves an edge in order to stand out from the pack. So, what did they do? When comparing the technical specs of the Kobo to the other e-readers, you won't find anything that really jumps out at you. The Kobo specs are middle of the pack type of stats. Yes, you have several options to choose from regarding how your actual Kobo looks, but as far as what it can do, it gives nothing remarkably different. 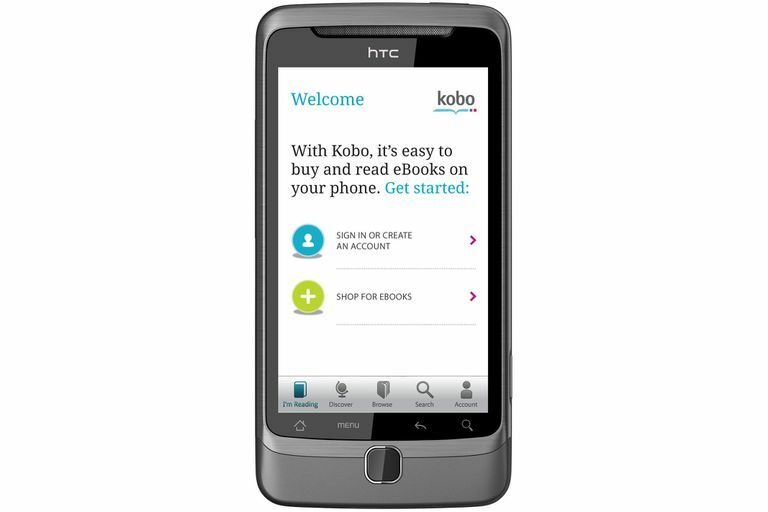 The Kobo welcome screen will prompt you to either enter your existing Kobo account information or to create a new Kobo account. Once your account is created, you will be taken to the "I'm Reading" page. This page is convenient, as you can choose to Search the Kobo market for any specific book title, browse through categories or check out Kobo's "Discover List," which groups titles into sections like, "best sellers, Oprah's Book Club, Featured Free Titles," and several other groupings. Once you choose a book, press the "Download Book" soft-key to store your e-book to your Android phone. Once you have a book downloaded, it will appear in the "I'm Reading" menu of the Android app. Similar to Apple's iBook app, each book will appear on a bookshelf that you can select to begin reading. Once you have your book saved and are ready to begin reading, you will find that you only have a few customizing options. Pressing your Android phone's menu key will bring up the limited menu. The adjustments you can make are the font size, font style, and night-mode. The font size options are pretty simple, allowing you to choose from 5 size options. Looking to use your favorite font? Well, unless your favorite fonts are either Sans Serif or Serif, you are out of luck with the Kobo app. Night-mode is convenient as this mode turns the font white and the background page black. I am not sure if this does anything to diminish the battery drain but it does make it less of a distraction for others when reading at night. Two features that the Kobo Android app lacks really cause problems. One is that you can't add manual bookmarks using the Kobo Android app. All that is saved is the furthest page read. The second is the limited options available to customize the reading screen. When compared to the Nook app for Android, the Kobo is just anemic. As will most of the smartphone e-reader apps, the Kobo will sync with your Kobo as well as any other Kobo apps. We have an iPad and a cell phone with the Kobo app and found that these two devices are perfectly synced. Though we do not own a Kobo e-reader, we are sure that the syncing feature works just as well. In a competitive market, Kobo needs to improve its Android reader and provide users with a truly customized reading experience. Without that ability, the Kobo is a "must have" if you own a Kobo e-reader, and an "okay to have" if you just want to have a competent book reader app installed on your Android smartphone.